Nelson Mandela’s courageous spirit and belief in the right of all people to be equals and live in harmony allowed him to overcome incredible obstacles. Even though he spent close to three decades in a South African prison, his is a story of hope and success. It is quite impossible to look at the life of Nelson Mandela without being inspired by his accomplishments and strength of character. His fight for peace and equality in South Africa cost him his freedom and brought with it hardships and struggles unimaginable to most. Born on July 18, 1918, Nelson Rolihlahla Mandela grew up in a small village in South Africa during British colonial rule. The first in his family to attend school, he went on to study law at university and graduated in 1942. It was around that time that Mandela became particularly interested in the increasingly unstable politics of his country. In 1944, Mandela joined the African National Congress (ANC), a pro-democracy political party, where he helped start the ANC Youth League and was committed to building non-violent activism against the oppressive Afrikaner white minority. In 1948 the Afrikaner-dominated National Political Party took power in South Africa and began its apartheid policy of racial segregation. Apartheid, meaning “separateness” in Afrikaans (one of the official languages of South Africa), lasted 46 years until 1994. It geographically segregated non-white people and forcibly prevented them from having a voice and a vote. Education, medical care, and other public services were inferior for all non-whites. 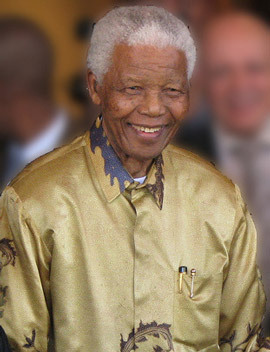 Fiercely objecting to the racist treatment of all coloured people in South Africa, Nelson Mandela became leader of the ANC and focused on fighting against the apartheid. After many years of non-violent protest, increasing violence and repression from the state against non-whites convinced Mandela to go underground in 1961 and take up an armed struggle against government and military targets as a last resort. After living as a fugitive for 17 months, Nelson Mandela was arrested, tried in a biased Afrikaner court of law, and thrown in jail. He spent the next 27 years of his life in prison performing hard labour in a lime quarry. The conditions were poor and even the prisoners were separated by race, with black prisoners receiving the least of the rations. Mandela was allowed only one visitor and one letter every six months. 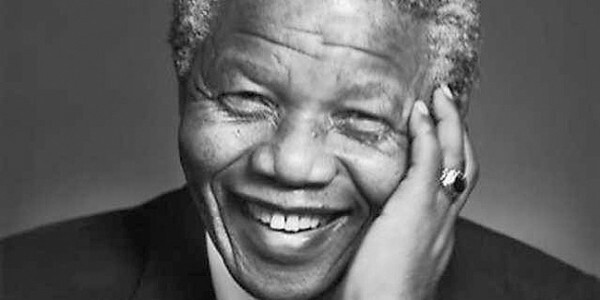 During his time in prison, Mandela became an inspiration for the anti-apartheid movement. His dedication to the African people and to the ideal of a free and democratic society where all people would live in harmony kept hope alive for the South African people. Local and international pressure intensified, and on February 11, 1990 Nelson Mandela was released from prison. On the day of his release, even after all the pain and hardships he had endured, Mandela made known his commitment to a peaceful reconciliation with the white minority of South Africa. 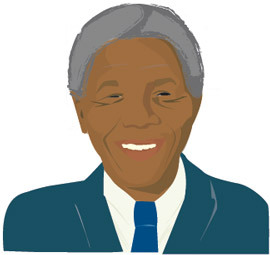 Nelson Mandela helped bring an end to apartheid, transitioned the country into a multi-racial democracy, and became the first president of South Africa democratically elected by its entire population. Many South Africans fondly refer to him as “mkhulu,” the grandfather. 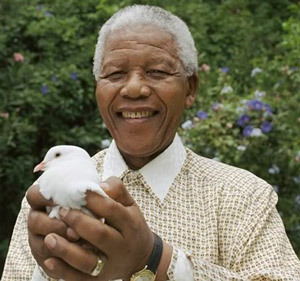 He has earned over 100 awards, including the Nobel peace prize for his incredible spirit. Today, while still involved in South African politics, Mandela continues his work on an international scale. He is an activist for HIV/AIDS awareness and against human rights abuses, among other issues. He is without question one of the most important figures in recent history and a man whose story of determination and hope gives strength to people all over the world. Editor’s Note (Dec/2013): We mourn the passing of Nelson Mandela at the age of 95 and celebrate his spirit and message which will continue to inspire this and future generations. Written by Faze’s Jayme Poisson. Illustration by Faze Intern Maggie Drummond. What an inspiring story, too bad he had to die. I like this Nelson Mandela.